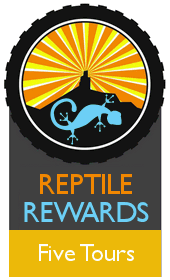 To honor the loyalty of our wonderful guests Lizard Head Cycling Guides has created the Reptile Rewards program. To sign-up all one has to do is to inform us of their previous tours when making a new reservation. Please Note: The Reptile Rewards program is retroactive to 2015. After 10th: A Surprise! There are a few special clients that will hit 10 trips in 2019! Lizard Head Cycling Guides can provide riders a Free-Bike-Rental/Alumni/Early-Bird/Group and Born on the 4th of July Discount. With all these discounts added together we’ll actually be paying riders to tour with us. 🙂 In all seriousness, tour discounts, including Reptile Rewards(*), are not “stackable”, meaning if there is more than one applicable cash discount for a rider’s tour, the highest valued discount is picked. 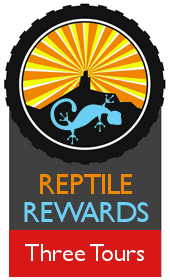 NOTE: Reptile Reward non-cash incentives (referral credits) accumulate and can be used together with applicable cash discounts. STIPULATIONS: #1 Guest Referral credit is applied after the referred guest goes on a tour. #2 Discounts are not applicable on 3 or 4-day tours. #3 If a tour has not met its rider minimum of 6 riders and Lizard Head Cycling decides to run the tour, discounts are not applicable. #4 Discounts must be declared at the time of the reservation. (†)Cannot be applied to existing reservations or combined with other discounts. Are you ready to register for one of our tours? Great! Then go to our Registration page to sign-up today online.